Winter in the Pacific Northwest can be very drab and gray. January is one of the wettest months of the year and certainly the darkest with the sun setting at 4:30 in the afternoon. But my garden doesn’t have to be drab, and neither does yours! Colorful berries are a great way to brighten up your garden. 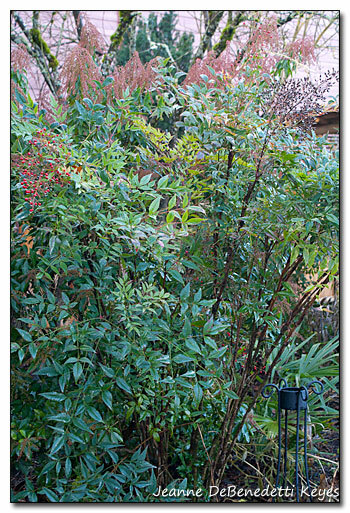 Two plants I find invaluable for colorful berries are PNW native, Pacific madrone (Arbutus menziesii) and heavenly bamboo (Nandina domestica). Of course, the madrone is also a winner for its colorful, peeling bark, shiny evergreen leaves and pretty white, bell-like flowers in late spring, early summer. Although madrone can be tricky to transplant, it is a care free plant if given full sun and well-draining, acidic soil. Our native tree generally stays within a height of 30 to 50 feet in gardens, however, in its native habitat it can grow to 90 feet. Nandina domestica is also an extremely easy care plant, seeming to thrive in average garden soil and is very drought tolerant once established. Not only does it sport beautiful red berries, but also the leaves will often turn vibrant crimson and orange tones with cold weather. Heavenly bamboo (below left) with its slender, bamboo-like leaves, matures to a height of 6 feet. The birds love the berries even though all parts of the plant, including the berries are extremely toxic, containing hydrocyanic acid, which can be fatal if ingested. Nandinas rarely need pruning unless you want to cut the frothy, white flowers or a spray of leaves for a bouquet. The species does tend to sucker in rich soil. 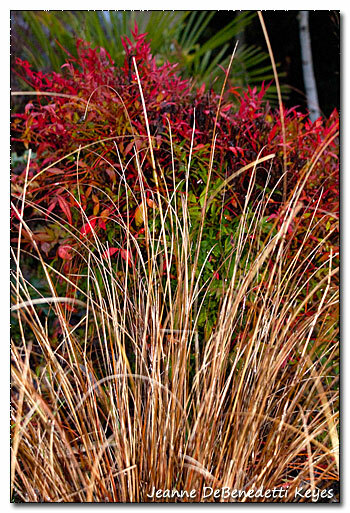 A Nandina domestica ‘Compacta’ (below right) grows behind Carex ‘Toffee twist’. The leaves are wider than the species and generally do not produce as many berries if any at all. However, as the name implies, the plant only grows 3 to 4 feet tall and wide. 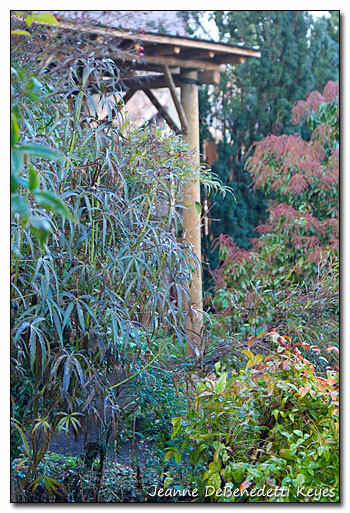 Colorful foliage, bark and leaf size and texture can also add interest to the winter garden. The carex lends an interesting biscuit color along with a fine, grassy texture to the garden. The white bark of a Quaking Aspen (Populus tremuloides) is visible in the background. Although, windmill Fan palm (Trachycarpus fortunei) gives the garden a tropical look, it is very hardy in the PNW (hardy to -15 degrees). The palm is drought tolerant and very easy to care for. The leaves are evergreen and the size and shape of the leaves are quite distinct and unique looking.I find this plant very useful in the garden for those reasons and more! Pieris japonica ‘Varigata’(right photo), also known as lily of the valley shrub, provides a colorful and evergreen presence in the garden. The white edging of the leaves stands out against the medium green of the interior of the leaves. Pieris japonica comes in many different leaf and flower colors, is hardy to USDA zone 6 and once established is very drought tolerant. 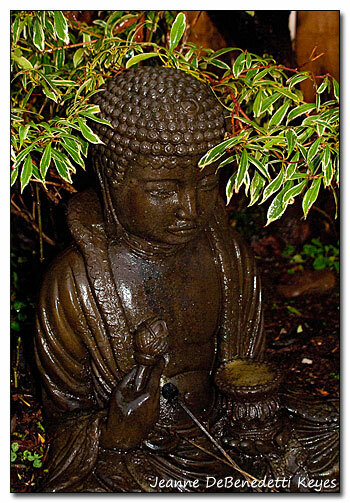 Lastly, leave some of your garden art out, as long as it is frost proof, to enhance the plants and provide interest. I find it comforting to see some of my cherished garden sculptures out and about. And of course, they look great covered in a light dusting of snow!